I was on the West Coast during The VERGE: Queer New York Fashion Week Show but that didn't stop me from getting the stylish scoop. Check out all of the photos and details below! Is gender non-conformity a trend or a movement? With that question in mind, The VERGE: Queer NYFW Show took place on Thursday, September 17th at the Brooklyn Museum to much fanfare! With over 1000 attendees, including celebs, and featuring 8 designers, it was easily one of, if not the most well attended show during fashion week. Celebrity models who walked include: model Rain Dove (Vogue, W, Buzzfeed, Ace Rivington), Ryley Ruben Pogensky (Barney's Trans campaign, photographed by Bruce Weber), model Merika Palmiste, Prince Harvey (created album in an apple store), and Melanie Gaydos (model with ectodermal dysplasia). Celebrity attendees included: model Elliott Sailors(H&M), androgynous model Harmony Boucher (Calvin Klein), and Love and Hip Hop: Atlanta's Margeaux Simms. It was MC'ed by Tiq Milan (national spokesperson for GLAAD). Katya Moorman/Karen L. Dunn for runway pictures, and Alyssa Meadows for Step and Repeat photos except where noted. But more importantly, it showcased the work of 8 queer designers who are at the forefront of this fashion movement and proving that gender non-conformity is here to stay. 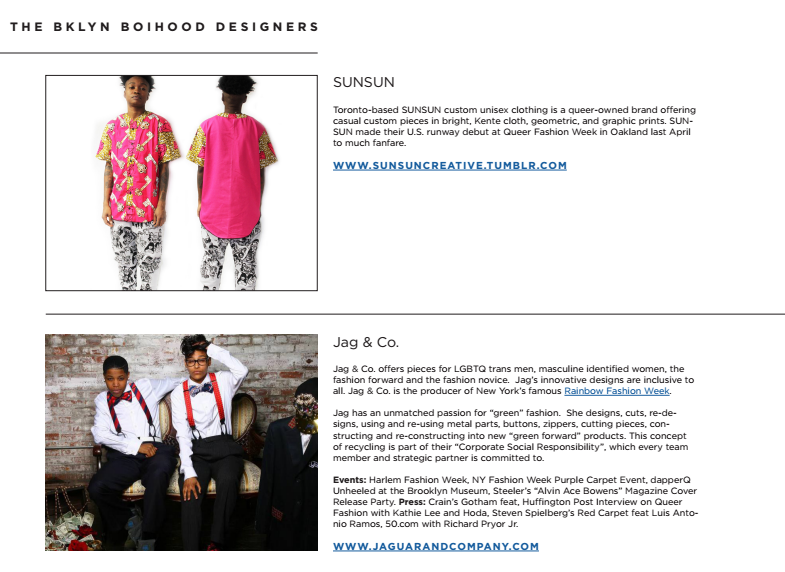 The designs fit all aesthetics and gender presentations, with the sleek, "green" suits of Jag & Co, to the clean, progressive high end sportswear of SAGA NYC, to the sophisticated, minimalist approach of KQK and more. Please find the post-release with pictures and more about each designer attached. VERGE: Queer NYFW Show was executive produced by Anita Dolce Vita, owner of DapperQ, and associate produced by bklyn boihood, Posture magazine, and DYDH Productions, with runway direction support from Colette Lee Productions. But I feel fat though: Why is Kim Kardashian hot and Serena Williams a man?